Arrow Sewing Cabinets: We Have Our Monday Gidget Winner! First, we want to say thanks to all of you that helped us get the registration errors figured out today. We think we have those pesky bugs licked! If you didn't have time to register - don't worry, we will be giving a Gidget away every day this week. Gidget is so excited she put on her party hat! Now without further ado, our winner is Becky Weimer from Punxsutawney, PA! Congrats Becky! We'll be emailing you shortly! A big HUGE congrats to Becky..... I am sure you will love it. It is good to be Becky today! Congrats! Congratulations!!! What a great win! Enjoy it for years and years! Congratulations Becky! Enjoy your awesome table. 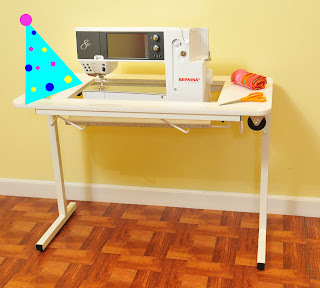 Use it in good health (and great sewing projects)! That is sew cool Becky!!! !